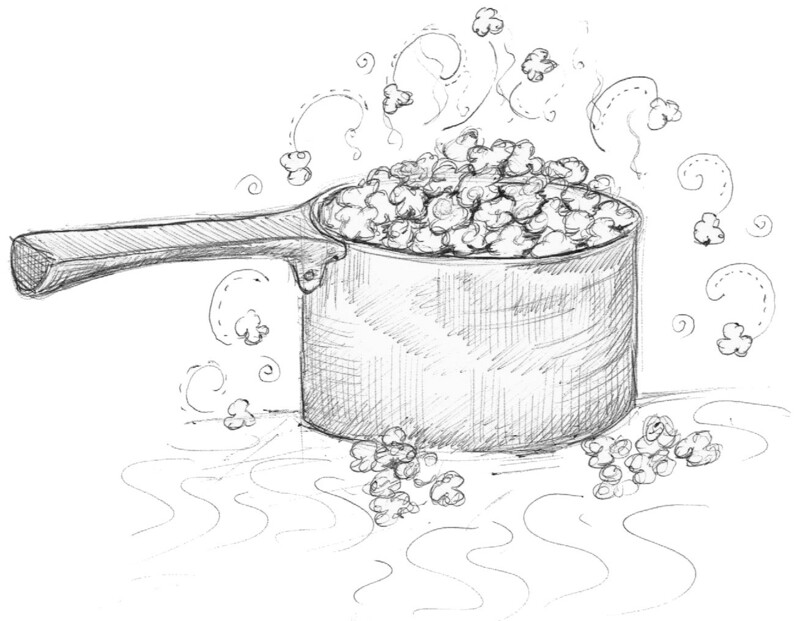 I have been made really happy by the response from my students to the first tune in ‘Fun, Games and Party Pieces’: ‘Popcorn’. 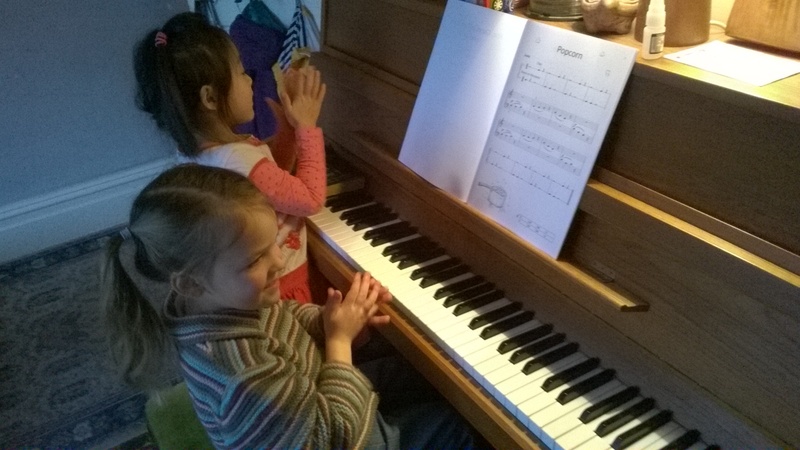 They love knocking on the piano and clapping, and take to the rhythm immediately with wide grins all round. The melody which follows is shared between the two hands and has several kinds of symmetry which the children are pleased to discover, making the whole piece gratifyingly easy. Pattern recognition is a huge part of understanding music, and how switched-on you are to the patterns in tunes (not necessarily consciously) will determine how successful you will be at learning pieces. I teach my students the chords – um cha, um cha* per bar – and we play it together, playing the percussion parts alongside each other. The students have to get straight to their starting notes on time, feeling the pulse through the clapping and into the notes. It makes an enjoyable game when you’re doing this alongside each other. I hadn’t considered that this music might be for pre-schoolers at all until my four year old daughter and her friend saw it open on the piano and asked to learn it, drawn by the pictures of popcorn. They grasped the knocking and clapping just as quickly as the older children. 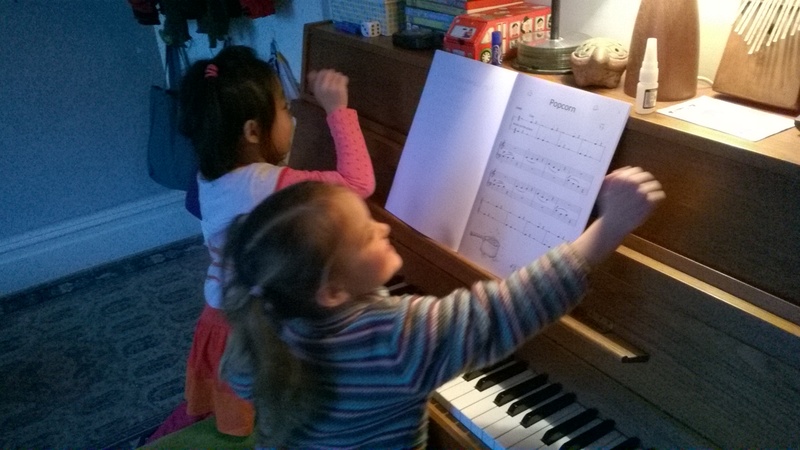 We started the melody on a C# rather than a G, then the girls could follow the black notes up and down; that pentatonic scale ready-made for them. They have to work out which hand to use, and whether it goes up or down. The tune is then finished off with the knocking and clapping once more. So if you play this tune with tinies, teach it on the black notes! I came up with some lyrics to go with the tune, and have been using with all my students ever since. Eat it up; popcorn’s gone. This entry was posted in Fun Games and Party Pieces Beginner, music teaching, piano and tagged beginner piano music, fun piano lessons, music teaching, piano teaching. Bookmark the permalink.